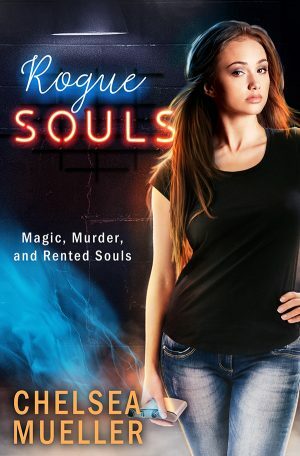 Rogue Souls is the second title in Ms. Muller’s fascinating and original Soul Charmer series. Picking up after the conclusion of the first book, the story follows Callie Delgado as she delves deeper into the mysterious soul magic thrust upon her by the Soul Charmer. Callie is starting her “apprenticeship” with the Soul Charmer, and her brother is living with her as he detoxes. Callie’s journey is a violent and dark one, leaving her questioning the direction her life is heading. Overall, I continue to find the premise behind the stories interesting; however, I had some issues with the book and found it difficult to stay connected to the story. But there are things I enjoyed a lot. I like the developing relationship between Derek and Callie. I appreciate that they acknowledge the darkness of their actions and within each other without turning away. I love how Derek always has Callie’s back, giving her the support and love she’s been missing. I also enjoy the deeper philosophical discussions about why people rent souls. The author has created a complex and exciting mythology. One of the things that bothered me about the mythology/storytelling is Callie’s extreme reactions to souls and soul magic. I wanted to understand why she gets so cold that her hand literally freezes up with users and her body catches on fire with too many souls. It feels arbitrary, and I needed to understand a connection. As the story develops, more soul magic secrets come to light; however, I felt that every bit was just a piece and the whole picture continues to elude me. Another reason I struggled connecting to the story is the amount of repetitive observations and comments made by Callie. Things like how Callie hates working for the Charmer and how he’s subhuman. Or the fact that she rented a soul only once and her general thoughts about soul-borrowing. Or how “Tiny pieces of your own soul were ripped away with every extraction of a rented one.” It’s like the book is spinning its wheels but not moving forward. Finally, I was disappointed on the lack of follow through on some significant events. For example, when Callie and Derek were having dinner with Callie’s estranged family. Callie uses her soul magic in a very invasive way, but then we don’t see the outfall from her actions. I would have liked some page time dedicated to the reactions of her mom and brother. Another example is the lack of follow up on Callie’s relationship with her boss, Louisa, and the repercussions of Callie’s actions. Although I enjoy the premise of the series and really liked parts of Rogue Souls, unfortunately, I never connected completely with the story or its characters. I found myself waiting for something more to happen, feeling like I was just drifting along from scene to scene. There would be times when events picked up, and I was momentarily caught up, but then something would happen to pop the bubble.